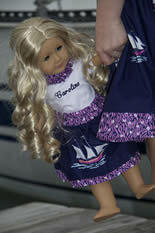 All of our clothing that is available for girls are available in a matching doll garment. If there is a garment for which you do not see a corresponding doll garment, please let us know and we are happy to create one! We are happy to make any garment in any of the current fabrics available for the season. Monogramming for a doll can be done as easily for your girl! Just order a matching monogram tee, or add monogramming to a dress! We believe that any piece of clothing that leaves our shop should be of the highest quality workmanship, whether is a big girl garment or a matching doll dress, skirt or shirt. You will find all of our doll garments lined when necessary, serged and finished, and properly trimmed. Similar to the care of our other garments, these can be washed, dried and lightly ironed when needed. It is also important to us that a girl be able to dress her own doll. Face it, we are mothers too, and it is hard to have to stop and dress your daughter's doll every time she changes her mind! And many of these dolls change clothes like a superstar! On our garments you will find elastic waists, velcro down the back, and fixed details. In other words, it will be easy to put the garment on for the average five year old, and any bows that are attached will be sewn in place to prevent having to be tied and retied! Dressing a doll should be fun - not work!